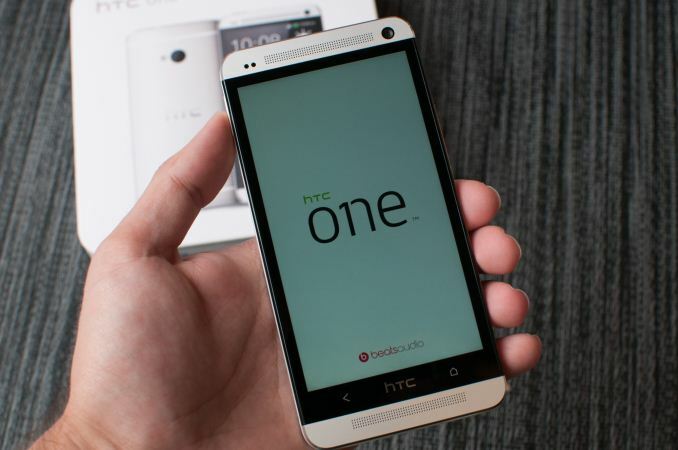 The HTC One includes a 4.7-inch 1080p LCD display. 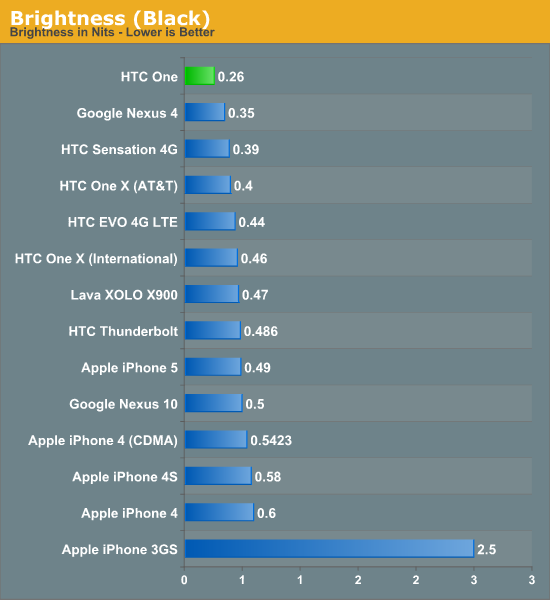 I thought the HTC Droid DNA slash Butterfly was probably around the highest we would see pixel density go for a smartphone, turns out the HTC One is even higher, obviously, given its smaller size. The display is what HTC calls Super LCD 3, previous revisions were Super LCD 2. As far as I know this is an IPS display as well, Low Temperature Polysilicon (LTPS). Atop the display is a Synaptics ClearPad Series 3 S3202 with 10 point touch detection. This isn’t in-cell based on the presence of S3202. I did some digging, turns out the display is curiously marked as being from JDI (Japan Display Inc) who also was behind the DNA and Butterfly display. In fact there’s even a press release from JDI about a display with those exact same specs (5.0 inch, 1080p, 443 PPI). Of course the One is even higher, 4.7 inch, 468 PPI, no doubt this is a different revision. Interestingly enough I believe Samsung display is also a secondary supplier based on the string I saw dumped. For interested parties, this resolution and size puts the HTC One display in a category above xhdpi, the nascient xxhdpi Android density which is technically for 480 PPI but 470 PPI is apparently high enough to qualify as well. 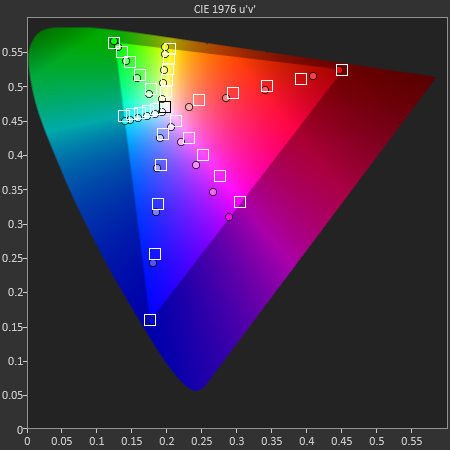 HTC internally defines the One as being 480 PPI to meet this threshold. 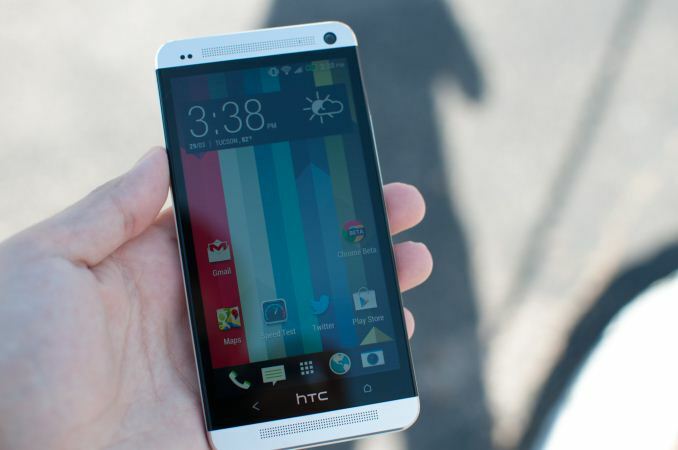 Subjectively, I find the HTC One display nothing short of amazing. The DNA already was incredibly high resolution, the One is even better. 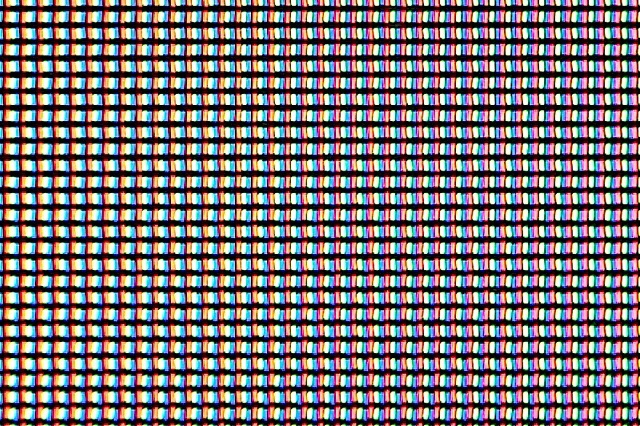 That level of resolution definitely exceeds my visual acuity, and is a sight to behold. When it comes to viewing angles, they’re excellent indoors and just about the same as every phone outdoors. There’s hardly any gap between surface and display with the One at all, it’s brilliant indoors and out. To say that 1080p on mobile devices has spoiled me is putting it lightly. In addition, 4.7 inches seems to be a nice middle ground in terms of display size — it’s close enough to 5 to not seem small, and not absurdly huge. The HTC One includes a dynamic contrast function which can’t easily be disabled, as there’s no option in the display settings for it. There are obvious log messages which get dumped which reflect the dynamic contrast’s presence as well. This makes measuring contrast and black level somewhat difficult since it’s always adjusting brightness based on the content. HTC makes it pretty subtle, but it is definitely there. The One goes nice and bright, at just shy of 460 nits. If you believe the contrast and black levels, it’s also incredibly contrasty. I suspect that real contrast is much closer to 1000 though than 1700+ given the dynamic contrast. I did the usual thing and ran the One through our new-ish smartphone display calibration workflow. In the past I’ve been very pleased with HTC’s calibration, publicly I said that the One X was probably the best Android-landscape display I had seen for that generation, and the One S was by far the best I’ve seen SAMOLED calibrated and the most well controlled I’ve seen it out of the box, no joke. 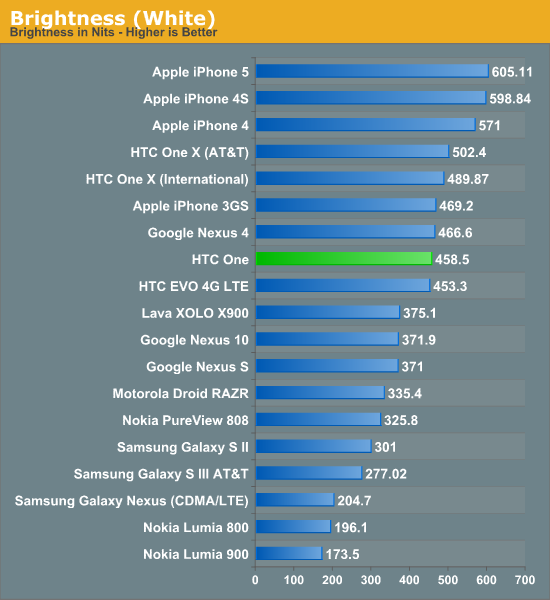 By the numbers the HTC One is better calibrated (lower Delta-E is better in the table) than the One X or DNA, and the color space comes very close to sRGB out of the box. It is demonstrably better than the predecessor in every way, and amazingly gives the iPhone 5 a run for its money in saturation and the GMB color checker card. Inexcusable however is the 8000K+ white point, which is blue, although during use I never have looked at the One and thought wow this is really blue. I think we’ve gotten to the point in the smartphone landscape where we have enough PPI, maybe a bit overkill honestly. There’s really no point in going much beyond the visual acuity limit, you could make an argument about nyquist and covering a few edge cases where the 50 percent square wave assumption built into 1 arcminute doesn’t hold up, but there’s no need to go much beyond this. Instead, now we need to get color accuracy tracking well and not drifting during a product’s lifespan. 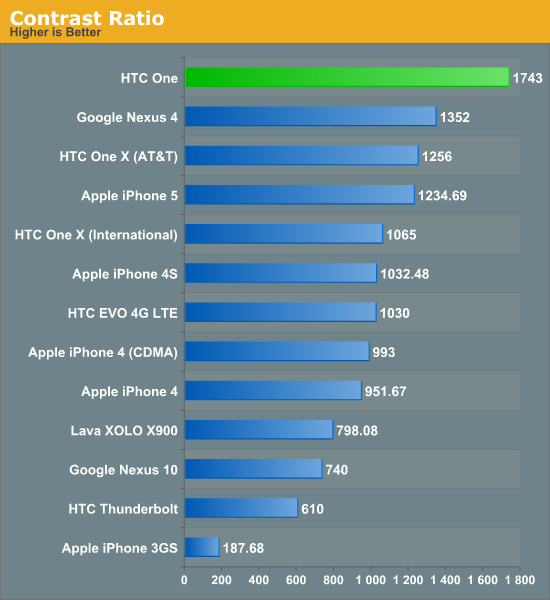 I think HTC continues to do a much better job than all the other Android OEMs, but only Apple is really taking things seriously here and taking the couple of dollar hit to have each panel calibrated. That said the HTC One’s display is a sight to behold, it is incredibly crisp and sharp in every condition you can throw at it.